Pellet stoves vary in quality, support, technical advantages, and sophistication. Selection is very important because you want your investment to pay for itself over and over again. Speak with one of our specialists to gain insights before you buy. You may also want to check out the pellet fuel cost calculator at page bottom. 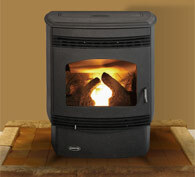 Quadrafire Classic Bay 1200 pellet stove. At 47,000 BTUs, this healthy sized pellet heater is right for many mid to larger homes. Proven design. Thermostatic operation. 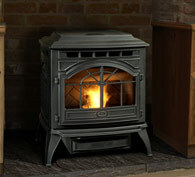 Quadrafire Castile pellet stove. 34,000 BTUs and beautiful cast iron exterior. Thermostatic control and proven technology in a high quality design. Quadrafire Santa Fe pellet stove offer 34,000 BTUs and thermostatic control in a modern styling. Log set optional. Quadrafire Classic Bay 1200 Pellet Insert. With 47,000 BTU capability, high efficiency and easy thermostatic control, the 1200 is one of our most popular pellet inserts. Gold trim shown optional. Quadrafire Mt Vernon AE Pellet Insert. This big and bold multifuel pellet insert heats larger homes with over 52,000 BTUs capability. Sophisticated programmable control system with auto-clean function and DC motors make this a popular choice with discriminating pellet enthusiasts. Quadrafire Castile Pellet Insert is a favorite at 34,000 BTUs. Shown in optional brown enamel. Proven Quadrafire pellet technology in a cast-iron design. Reliable thermostatic operation. Quadrafire Santa Fe Pellet Insert - 34,000 BTUs. Contemporary and stylish this pellet insert offers a lower cost in a high quality pellet heater with the proven Quadrafire pellet technology that has made them a leader. Thermostatically controlled. You can click stoves on the catalog below; then filter for pellet stoves or inserts. 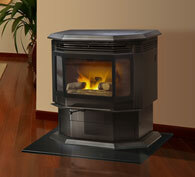 We feature Quadrafire brand pellet stoves and for more budget conscious: the Heatilator Eco-Choice group. The new Mt. Vernon Insert with Efficient Energy (E2) technology is the most powerful and efficient insert ever designed by Quadra-Fire. E2 technology helps achieve 87% efficiency—saving money by burning less fuel. Plus E2 technology automatically adjusts the blower to maintain desired room temperatures. A 47 lb hopper and easy-clean cast iron firepot reduce maintenance efforts. And the Mt. Vernon E2 is the only product available with cast iron construction on all major components—proving it’s built to last. Osburn 5000 Pellet Stove. This pellet stove is the cutting edge of heating appliances for those who choose to go green. Pellet heating units offer more efficiency and have fewer particle emissions than the traditional wood-burning stoves. One advantage of a pellet burning stove is that it can be vented through a small hole in the wall instead of a chimney. Owning an Osburn 5000 Pellet Stove offers the flexibility of using pellets made from sawdust or other small wood particles. The Osburn 5000 Pellet Stove offers a bottom feed technology with an advanced combustion system. This stove has an LCD touch-screen control panel with heat settings and 6 controls for your convenience. 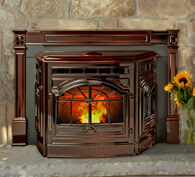 This heating appliance adds an updated look to your home while keeping your home warm. Heating your home with the Osburn 5000 Pellet Stove has never been easier with the electronic igniter. This heating unit can function in thermostatic or manual mode. Owning an Osburn 5000 Pellet Stove will heat your home effectively without sacrificing style. The clean and vertical look of the Osburn 5000 Pellet Stove adds charm while putting out 50,000 BTU’s. This heating appliance has a combustion time of 35 hours. The Osburn 5000 Pellet Stove can be installed in many areas of your home.